Pen and Paper: CARTES POSTALES FROM GREECE. 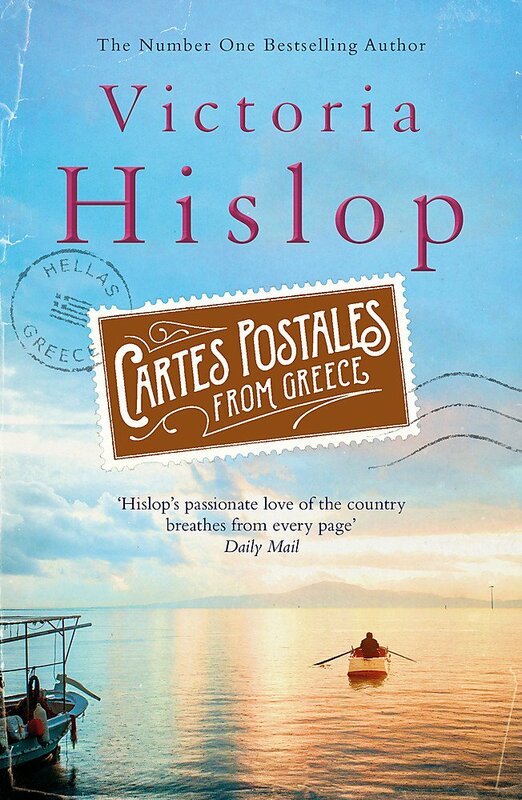 CARTES POSTALES FROM GREECE by VICTORIA HISLOP. Week after week, the postcards arrive, addressed to someone Ellie does not know, each signed with an initial: A. These alluring cartes postales of Greece brighten her life and cast a spell on her. She decides she must see this country for herself. On the morning Ellie leaves for Athens, a notebook arrives. Its pages tell the story of a man's odyssey through Greece. Moving, surprising and sometimes dark, A's tale unfolds with the discovery not only of a culture, but also of a desire to live life to the full once more. They arrived dog-eared, always torn, often almost illegible, as though carried across Europe in a back pocket. Costas lay down, hoping to allievate these unfamiliar aches and pains, stretching himself out close to the statue and putting his head on her shoulder. She was surprisingly soft, and his cheek fitted into the nape of her neck. Costas never got up again. Less an 'authentic' taste of the country and more a collection of urban myths and legends tied loosely together to form what here constitutes a plot; a series of short stories/anecdotes (not something that was indicated anywhere on the cover or I would have thought twice about buying the book) scattered amongst which are a some journal entries, postcards, maps and photographs, I get the distinct impression that the author didn't know where she was going with this 'novel'. Disappointed that the writing wasn't much to write home about (sorry, I couldn't resist the pun); that the story-within-a-story approach just didn't do it for me, that despite having proven herself a passionate novelist when it comes to Greece as a setting, it was almost like she was taking notes and yet somehow just wasn't able to convey it onto paper. Perhaps merely disillusioned by the fact that here was another of the author's books that to my mind failed to live up to her debut novel, I'm beginning to think that The Island was a bit of a fluke; 'beginner's luck' if you will and that I ought not to seek out any more of her books. Then again .... never say never. Sorry this one turned out to be a disappointment. This is an author I've heard good things about, yet I've not ever read. I'll have to look her up again - I was thinking she maybe did some historical fiction. She does Kelly. The Island is wonderful (I must have read it pre-Pen and Paper, if you haven't read it you must) as is The Thread and The Return, both of which I've reviewed here. What a shame! I enjoy books that are half travelogue and half fiction, but it has to be cohesive. Hopefully she'll turn it around for you with the next book. Too bad that this fell flat as the premise sounds good. I think that sometimes an author shows thier best in thier first book and then has little left. It seems this one fell short of your expectations in several ways. Thank you for your honest review. Well that is too bad this one disappointed you Tracy. Greetings Tracy. Sorry you was disappointed with the read. Hope your next one will prove of worth. Blessings to you. Love love, Andrew. Another author whose work I haven't read and knew nothing about (other than the fact that she is married to Ian Hislop of course), until your review made me curious enough to check her out. If this book is as you say, more like a series of journal / diary entries, come short stories, then it definitely wouldn't be one for me. If it is also illustrated, surely it reads more like a travel guide rather than a novel? I have to say that Victoria's books are hugely popular in the charity shop, but looking at the ratings and reviews on her books, none of the later stories have matched up to 'The Island' and they are in fact, on the decline, which is a little worrying. Still, for as many people who like yourself, have been a bit disappointed with this book, there are just as many who are raving over it. However, time is short, so I am more than happy to go along with your constructive criticism and not be in too much of a rush to read this one for myself. That is too bad this was a letdown, the plot sounds so good.